Pavla produces an interesting line of detail sets for a variety of subjects, each one designed to enhance a particular aspect of a given kit. 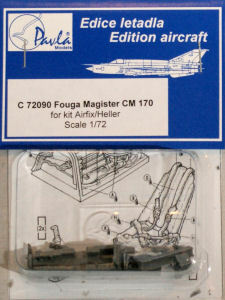 In this set, Pavla offers a nice update for Airfix/Heller 1/72 CM170 Magister. This set completely overhauls the spartan cockpit in the kit. 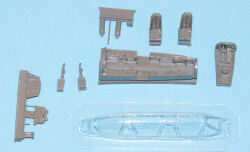 The set starts with a new drop-in cockpit tub for the front and rear cockpits with nice detailing cast into the side consoles. The set also provides new instrument panels, control sticks, and nice ejection seats. To ensure that you can see all of that nice detail, this set also includes a vacuformed canopy that is crystal clear. If you want to enhance your Airfix or Heller Magister kit, Pavla has the parts to get the job done!